Even if the formal results of his students, assistants and colleagues were remarkable, no one of them has showed the capacity to combine the perfect manual ability, the experimental use of the materials, the acuity to observe and the extraordinary sensibility for the anatomy, for the hair and for the ribbons, as well as him has done. Now we are able to admire how and the reason why he decided to realize this incredible masterpiece,this intimate and highly innovative portrait of lovely daughter of duke Lodovico and also young bride of Galeazzo Sanseverino. This masterpiece is now ready to occupy a special place into the exceptional corpus of artist’s operas. 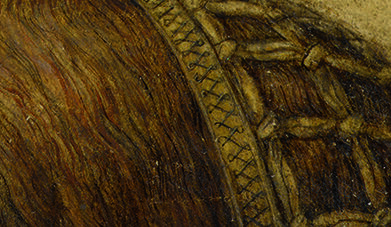 This represents the arrival point of an adventure started few years before 1500 and which nowadays shows itself to the people of the present with the evocative force of its protagonists and with sublime fascination of Leonardo’s works. 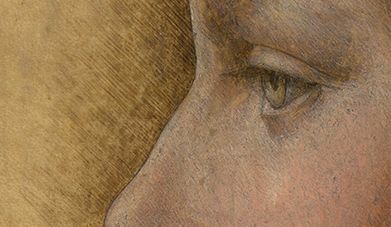 The painting mysteriously disappears from the book which travelled from Milan to Warsaw and then passes through the hands of several collectors, up to be analyzed by the maximum experts and by the most advanced technological institutions which finally comes to express that the portrait is of Leonardo.